Okay, to continue my survey of religiosity in more or less arbitrarily selected nations. Most of this data comes from Wikipedia, which has a series of entries, ‘Religion in (name your country)’, so I haven’t bothered with the time consuming process of linking to every source. 6% answered that they do not believe there is any sort of spirit, God, or life force. In 2009 the European Court of Human Rights, in a case brought by an Italian mother who wanted her children to have a secular education, ruled against the display of crucifixes in the classrooms of Italian state schools. It found that ‘The compulsory display of a symbol of a given confession in premises used by the public authorities… restricted the right of parents to educate their children in conformity with their convictions’ and that it restricted the ‘right of children to believe or not to believe’. This ruling was in marked contrast with the position of the Italian courts that had ruled in 2005 that crucifixes were allowed to be present in polling stations and, in 2006, that display of crucifixes in state schools was allowed on the basis that the crucifix symbolised core Italian social values. 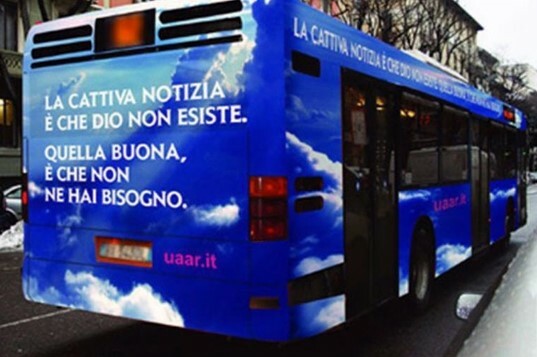 The same Wikipedia entry states that according to a 2006 poll (but no details are given), four million Italians are atheist or agnostic, a much higher number than for any other religion apart from Christianity. We should also be sceptical that those identifying as Catholic are anything other than nominal Catholics. I’ve picked this country out at random as an Eastern European country. Needless to say, there’s no such thing as a typical Eastern European country. Bulgaria does have a religious question in its census, and the Bulgarian Orthodox Church, a variant of eastern orthodoxy, is the prevalent and traditional religion in the country, with 59.4% of the population identifying with it in the 2011 census. No previous censuses are recorded, sadly. Some 9.3% identified as atheists, and 21.8% didn’t answer the question. 7.8% identify with Islam, a result of years of Ottoman rule, and interestingly neither Protestants nor Roman Catholics can claim even 1% of the population. The number of Jews in Bulgaria is minuscule, and anti-Semitism appears to be rife. Also, the number of practising orthodox Christians is quite low, and likely falling, though I have no figures on that. I was born in Scotland, so this region still interests me, in spite of the transcendental cosmopolitan plane that I now inhabit. The situation there is much the same as in other western European countries – predominantly Christian but with church attendance dropping sharply in the late twentieth century and still declining, and with immigration bringing an increase in other religions, but from a very low base. Anglicanism became the established religion in England thanks to the shenanigans of Henry VIII, but Scotland has remained, at least until recently, largely Presbyterian. There’s been much talk about disestablishing the Anglican church in England in recent times. I think it’s inevitable. It has already been disestablished in Wales and Ireland. 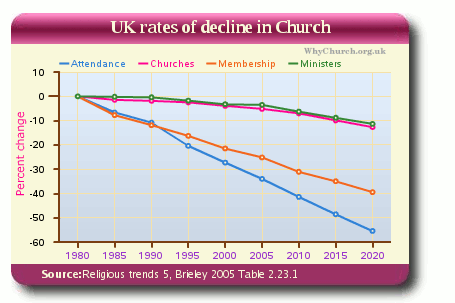 Wikipedia presents census figures for England for 2001 and 2011, which shows that identification with Christianity has dropped from 71.7% to 59.4% in 10 years – a really significant drop. Various other surveys show lower figures though, indicating again that the framing of the question makes a big difference. Everything suggests that a large proportion of the population identifies with Christianity out of habit rather than conviction. This can perhaps be more accurately described as cultural religiosity, which, as I’ve reported, is a common feature of Catholicism. Finally in Britain, as elsewhere, secular law is becoming less deferential to the claims of religion. The Equality Act of 2010 is making life more uncomfortable for denominations that continue to discriminate, though it remains to be seen how the law deals with the rise of largely unenlightened religions such as Islam. I’ll finish where I started, with an Asian country that appears to have embraced many western values and practices, including secular democracy. Needless to say I’m not doing justice to the enormous complexity of religious tradition in any of these countries, but it seems that Koreans, like many of their Asian neighbours, have been eclectic in their religious practices over the centuries. Korean shamanism, or Muism, goes back a long way, and has been overlain with Confucianism, Buddhism and more recently Christianity, which had its heyday there from the sixties to the nineties, leaving South Korea the most Christianised Asian population apart from the Philippines and East Timor. The South Korean National Statistical Office reported these figures in 2005: 46.5% non-religious (but many of these apparently maintain shrines to traditional religions in their homes), 22.8% Buddhist, 18.3% Protestant, 10.9% Catholic. The Wikipedia entry here points out the difficulties in measuring religious practice and adherence, with Confucianism, for example, being practically impossible to measure. There is also a proliferation of smaller religions in Korea that are likely to be under-reported. The late Sun Myung Moon started up a new Christian-based religion in South Korea in the sixties, hailing himself as the new Messiah, etc. It enjoyed moderate success in his home country and in the USA in the seventies, possibly because of its strong anti-communist rhetoric. 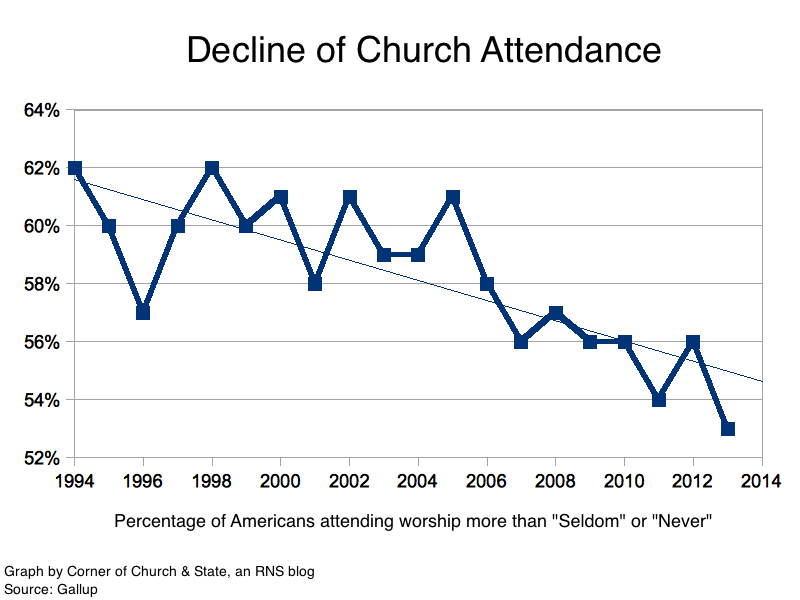 It seems that in recent years Christianity has been fading, and there has been some slight resurgence in traditional Muism, but I can’t find any figures on religious trends in general. So that’s a few blurry snapshots of religious trends in an assortment of countries, which show I think that Christianity at least has peaked in western Europe and in some Asian countries. I’ve also heard, in the wake of the new Latino pope, that Catholicism is on the wane in Latin America, a trend that this papal election is unlikely to substantially reverse. Generally it seems that Christianity sells well in poorer countries these days, but starts to fade as the nations find their feet economically, and their inhabitants get access to a decent education. Many of the world’s poorer countries are in Africa and the Middle East – but nations like Pakistan and Afghanistan are too doctrinally Islamic to be much of a hunting ground for Christians. Rural China remains a promising area of course, but the scenario changes daily. My attitude is that we shouldn’t be too impatient, we should just keep plugging away with our fascination with this world, the only one we have. who says they don’t have a soul? I wrote a piece a while back on what the Australian census tells us about religiosity in this country, and in that piece I talked also about trends, comparing the censuses of the past. I also wrote more recently on the overall trend away from religiosity in the west, quoting some interesting recent figures out of the USA. So, as I find this quite an exciting and encouraging topic, I’ve decided to look at more countries to get a broader and deeper perspective on religiosity and how it’s faring, particularly in the west. This is a country I’ve long wanted to find out more about, because it’s so often cited as a non-religious country, or the least religious country in the world, and so forth. The traditional religions of Japan have been Shinto and Buddhism, and more often than not a combination of the two, but these entwined religions have faded from the landscape over the last century, and especially since the war. Wikipedia tells us that about 70% of Japanese ‘profess no religious membership’, and it cites 2 sources for this claim, the first being a newspaper article in the Seattle Times (which itself doesn’t cite any source), the second being a rather more interesting meditation on religion and spirituality in Japan, from 2008, in an online mag called Japan Society. 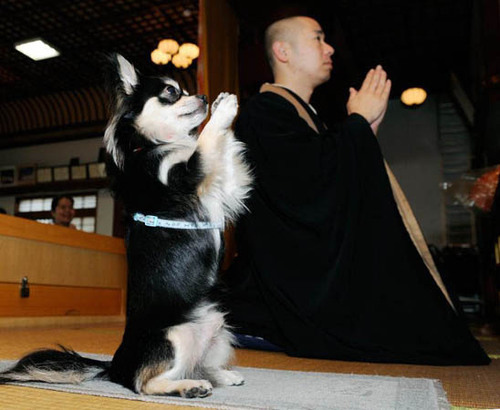 It contains the statement, ‘polls tell us that two thirds of Japanese profess no religion’. 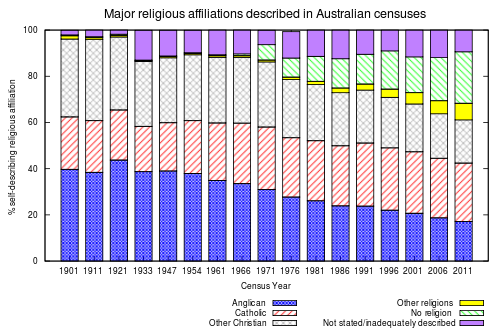 A number of other figures are mentioned from censuses and surveys, and obviously the figures vary depending on the wording of the questions, sample sizes and so forth, but it’s equally obvious that the trend is towards secularization., and it’s safe to say that more than half of the Japanese population are not religious. 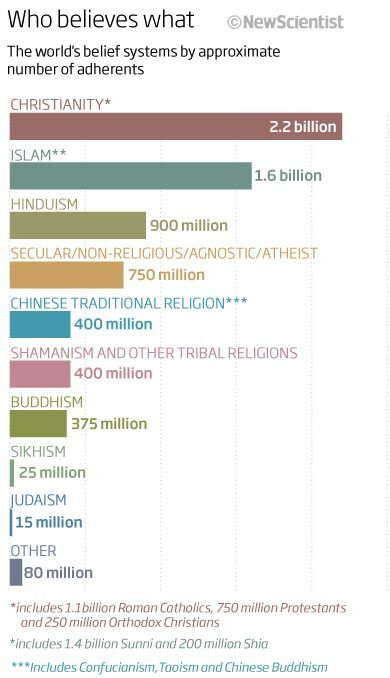 Apparently religion is measured in the Japanese census, as Wikipedia tells us ‘In census questionnaires, less than 15% reported any formal religious affiliation by 2000’. However, I can find no Japanese census figures online. As to Christianity, only 1% to 2% of Japanese have succumbed to that peculiar persuasion. To get a clear trend, you need to keep the sample stable, and the question stable, over time. A stable sample, for example , would be the entire adult population of a nation, as in a typical census. I can’t access these censuses, so I can’t find out whether the same question has been asked over time, and the other surveys mentioned are all over the place in terms of sample sizes and questions asked. All I have to go on is the quote above – 15% with no religious affiliation by 2000, which, if reliable, proves a clear trend away from religiosity in one of the world’s least religious countries. In May of last year, the Norwegian government voted almost unanimously to disestablish its state religion, the Evangelical Lutheran Church. The Vikings of Norway had become Christianized by 1050. In the sixteenth century, the nation moved firmly away from Catholicism, and has since, it seems, moved firmly away from Christianity. A 2005 Gallop poll conducted in 65 countries found that ‘Norway was the least religious country in Western Europe, with 29% counting themselves as believing in a church or deity, 26% as being atheists, and 45% not being entirely certain’, which is quite an interesting finding (I mean the uncertainty factor). Interestingly Norway has phased out questionnaire-based censuses, conducting its last in 2001, and I haven’t even been able to find out if religion was part of the census. A Eurobarometer poll of 2010 has different results, though, with 22% of Norwegians believing in God, compared to 18% in Sweden and Estonia, and 16% in the Czech Republic. The same poll finds that 94% of Turks and Maltese and 92% of Romanians believe in God. Islam is now the second most practised religion in Norway, though still at very low numbers. However, this is definitely a cause of dissension, as it is in neighbouring countries. France is typical of the European, or at least western and northern European trend towards reduced observance of religion. Again, a wide array of polls is mentioned in Wikipedia, with some funny findings. For example, a 2006 Le Monde poll found that 51% of French people claimed to be Catholic, but only half of these said that they believed in God! I mean, wtf!!! Seriously, though, a number of other polls probing Catholic beliefs in France raise questions about Catholicism everywhere, as clearly many of them are wedded to the religion for non-religious reasons, if that makes sense. There has been a lot of violent religious conflict, leading governments from the early 1800s to move to a more secularised political system. In 1905 a law was passed separating church and state, which clarified and regularised ideas first put forward in the 1789 Declaration of the Rights of Man and Citizen. Nevertheless the law caused Catholic riots, as it profoundly affected Catholic prestige and funding. 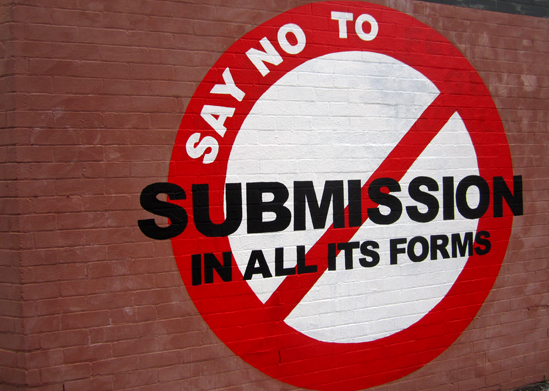 The government does not maintain any official figures on religious belief. The most recent private poll, from 2011, finds 45% to be Christian, 35% to be ‘irreligious, atheist or agnostic’, 10% not answering the question, and the remaining 10% dispersed among various other religions. Most French Christians are Catholic, but a recent poll amongst Catholics found that only 4.5% of them attended mass once a week or more in 2006, compared with 27% in the early fifties. Germany brought in new constitutions in 1919 and 1949, guaranteeing freedom of faith and religion. It has never had a state religion, being in any case a newish country, growing out of nineteenth century Prussia and the complex Germanic and middle European principalities of earlier centuries. The most recent poll in 2011 (the same poll that I referred to in the France section) has 50% of Germans identifying as Christian, 38% identifying as non-religious, and 6% not stating, but again other polls give different figures, though always with Christianity trending downwards in recent times. The Christian population is divided more or less equally between Catholics and Protestants, with more Protestants in the north and more Catholics in the south. 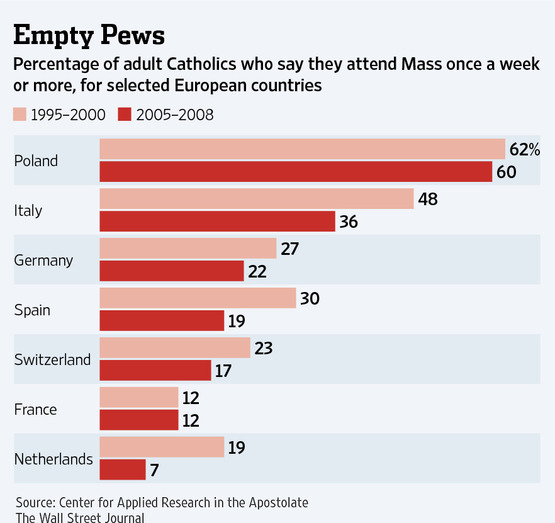 The west is more Christian than the east, probably due to the influence of communism in the former East Germany. As an amusing aside, the eastern state of Saxony-Anhalt, Martin Luther’s birthplace, is now the most non-religious state in Germany. Here’s another podcast, at last, this one on the census.